Feature Focus: Offline Player Library - DME Forensics Inc.
One of the biggest challenges we face when recovering video from a DVR using traditional methods is the inability to play the video footage without the “native” video file. Popular video players, such as Windows Media Player or VLC are unable to read and play back these proprietary files on your computer. When possible, DVR Examiner addresses this issue by providing you with a download option of the necessary native video program whenever you export files from the program. However, we understand that many of our users are taking DVR Examiner with them into the field, and unable to connect to internet all the time. For this reason, we are introducing the Offline Player Library. New with DVR Examiner 2.3, we have implemented support for our Offline Player Library. The library will be available in the form of a download from our support portal and will allow anyone who uses DVR Examiner on a dark computer to access all our native players without having to go to a web connected work station. Soon, the offline player library will be available as a download option along with new DVR Examiner versions and new Filesystem Database Updates. This single file, DVRExaminer.opl, can be added to the DVR Examiner installation directory (C:/Program Files/DVR Examiner) on your non-internet connected work station and DVR Examiner will be able to automatically pull the native player associated with the filesystem you are working with despite not having an internet connection. The Offline Player Library download is 371 MB because it contains information about all our native players. Because of its size, we do not automatically include it with DVR Examiner or the Filesystem Database Updates. 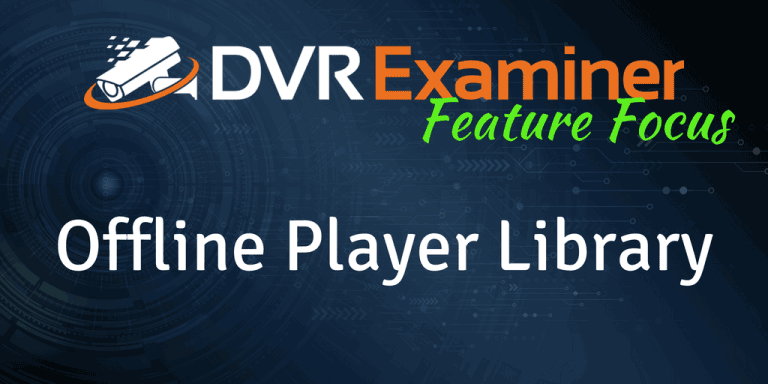 If you use DVR Examiner on a dark computer, you will soon be able to select the option to “Include Offline Player Library” when downloading a new version or filesystem update. If you want to download the library immediately or without needing to download a new version of DVR Examiner, you can access the library by itself on our portal resources page by clicking here.